Yeah!!!! New Kids To Play With Us! Home Yeah!!!! New Kids To Play With Us! College students who spend time with puppies are know to be happier and get better grades? AND – they have more money in their pocket as a result! Here are our two kids – Buddy and Sissy. They really are our kids. Believe it or not they are the same breed – Cavachons. 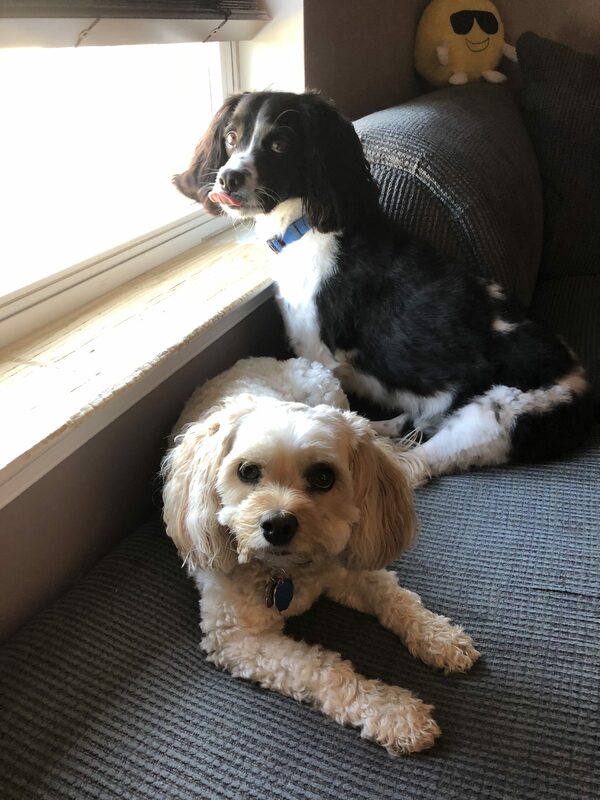 They are a mix of Bichon Frise and Cavalier King Charles Cocker Spaniel. They love to cuddle. Sissy is the diva dog and also the communicator – she will train you very quickly. Buddy is a bit timid but he is highly food motivated and a super warrior if he thinks his sister is in danger. We frequently need sitters throughout the semester at different times of the day or evening and also on weekends. We never leave the puppies alone for more than three hours. No – they are not spoiled – much…. Cavachons’ suffer from separation anxiety so we work hard not to cause them stress. When we need a sitter we send out a text or email thread. First to respond and say your available – get’s the gig. We pay $10.00 per hour. We live about 12 minutes from campus and if you don’t have a car – we will provide transportation. The house is always stocked with good food. You are even welcome to bring your laundry and do it while you are with the puppies. The best part – we have a 55″ TV loaded with DirectTV and Netflix and the puppies are really very low maintenance so you can bring yor laptop and connect to the VERY high speed wi-fi or you can Netflix and chill with two adorable puppies.